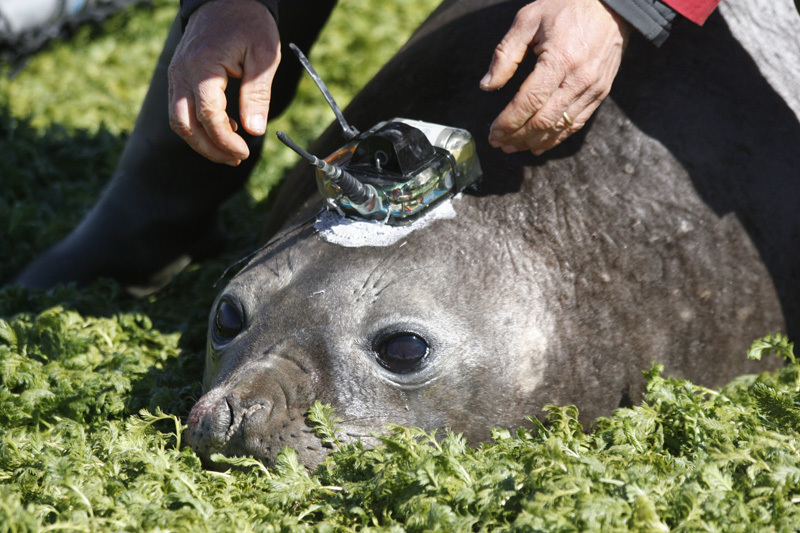 For the last 10 years, more than 200 elephant seals have been patrolling the southern seas wearing some strange headgear: an Argos transmitter instrumented with temperature, salinity and pressure sensors. The data these sensors acquire are fed in near-real time into the Mercator operational oceanography model and also tell us more about the animals' ecology. An Argos transmitter is bonded to the animal’s head using a quick-setting resin. Credits: CNRS-CEBC/SEaOS. The data we are talking about here concern the Antarctic Circumpolar Current, the strongest current in the world. The transmitters are all equipped with temperature, salinity and pressure sensors. Some of them also have a fluorescence sensor to estimate concentrations of phytoplankton, or a sensor to measure dissolved oxygen. Every time the animal surfaces to breathe, the antenna on its head uplinks the data recorded during dives to satellites overhead. 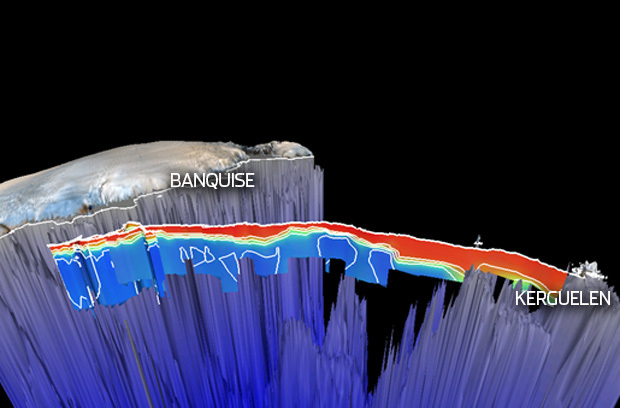 Concentrations of dissolved oxygen recorded by an elephant seal from November to January 2011 between the Kerguelen Islands (right) and the Antarctic (left). 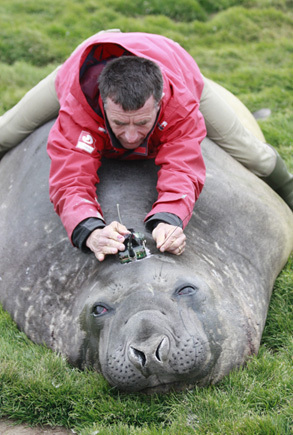 The animal dived to average depths of 500 m, but regularly descended to 800 m and once even as far down as 1,050 m. Credits: CNRS/CEBC..
Christophe Guinet performs a fine balancing act straddling an elephant seal as he fits an Argos transmitter on its head. Credits: CNRS/CEBC. But what the ecologist is looking to achieve today is to gain insight into the feeding strategies of these large seals. “We watch the elephant seals' movement with respect to their prey and to the currents,” he explains. “And we do that down to a scale of around 1 km.” Here again, satellites play a key role, as imagery from the Envisat satellite up to 2012 and from the U.S. Terra and Aqua satellites allows scientists to determine chlorophyll concentration in the Southern Ocean. And of course chlorophyll tells us where the phytoplankton and therefore fish and squid on which the elephant seals feed are to be found. “Today, we can even discriminate phytoplankton groups in satellite imagery,” says Christophe Guinet, who has been working on these aspects with Séverine Alvain at the oceanology and geoscience laboratory in Lille. To track currents, researchers use data from altimetry satellites like TOPEX-Poseidon and the Jason series, and from the Mercator model. “Our work lies somewhere between animal ecology and space oceanography, which is a fantastic tool for describing and understanding these animals' behaviour in the most remote ocean on earth. We live in really exciting times!” concludes Guinet enthusiastically.